The hotly anticipated follow-up to 2007's magnificent The Flying Club Cup sees its release on Zach Condon's own Pompeii Records imprint, marking a departure from both Ba Da Bing and 4AD, the band's previous labels. March Of The Zapotec is very much an album of two halves: the first plants us firmly in the familiar territory of brass instruments and mariachi bands, while the second marks a return to Condon's past life as an exponent of electronic pop, going under the alias Realpeople. Ably assisted by a small town Mexican funeral band, recruited specifically for this material, the first half of the album gets underway with a disheveled swagger. The likes of 'La Llorona' and 'My Wife' are typical of Beirut's brilliance for fashioning an entirely unique, singular strand of music that would seem to reference so many other cultures, yet never fully signs up to any of them. In addition to the obvious central American influence, you could just as easily discern elements of Eastern European marches and gypsy dances; Condon maps out a completely believable musical fantasy world that's suggestive of a host of far-flung places, yet belongs to none. On to the second half and 'My Night With The Prostitute From Marseille' certainly has a title that's lifted straight out of the usual Beirut idiom, but the plaintive synth melodies and shuffling drum machines put a very different slant on the songwriting. 'Venice' combines the electronic palette with Condon's own horn passages, establishing some sort of balance between the two extremes, an idea taken further by 'The Concubine', which beautifully knits together all the finest elements the album - in all its diversity - has to offer. The final track might just be most memorable though: 'No Dice' is a five-minute instrumental that's pure synth pop joy. There's no cor anglais, no tuba, just a single slab of bright, melodic brilliance that could hardly be further removed from the sounds of Gulag Orkestar. Who knows what's coming next from Condon? 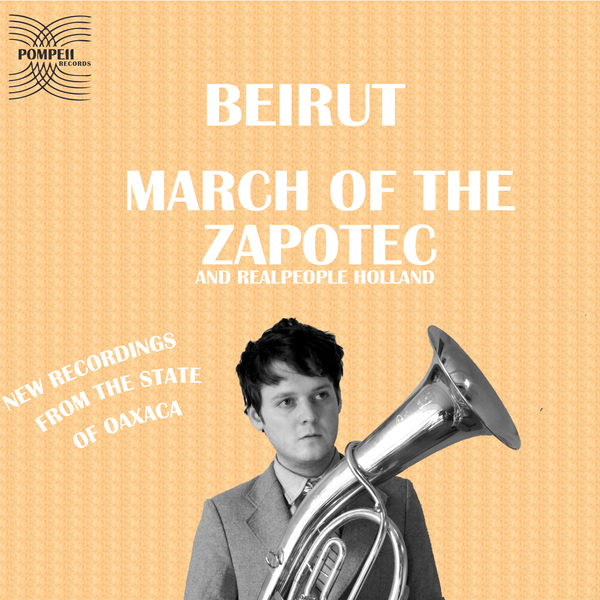 March Of The Zappotec suggests he's still willing to experiment with wildly differing sounds, and bravely, there seems to be no compulsion to adhere to any established, already proven Beirut formula. A bold and contrary album, but one that doesn't disappoint. Excellent.